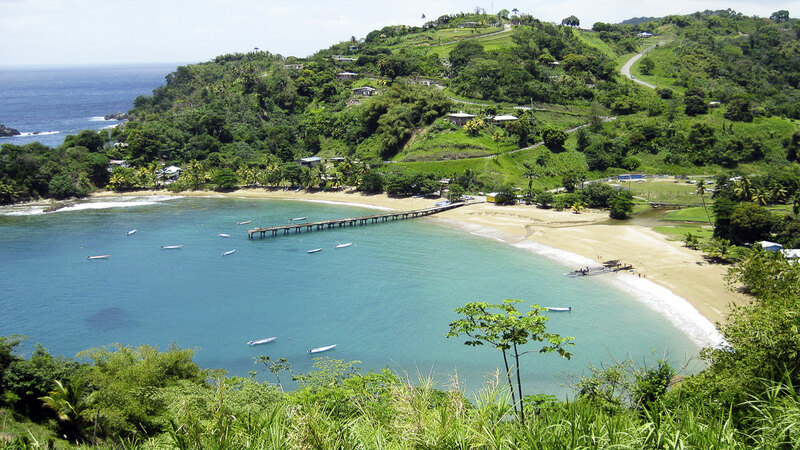 Discovering Tobago is your first step toward Paradise, staying in Parlatuvier brings you to its center. This part of the island has retained its local charm, unspoiled surroundings and spectacular views of the sea, mountains and tropical landscapes. It offers visitors a unique opportunity to explore and relax in its natural beauty. 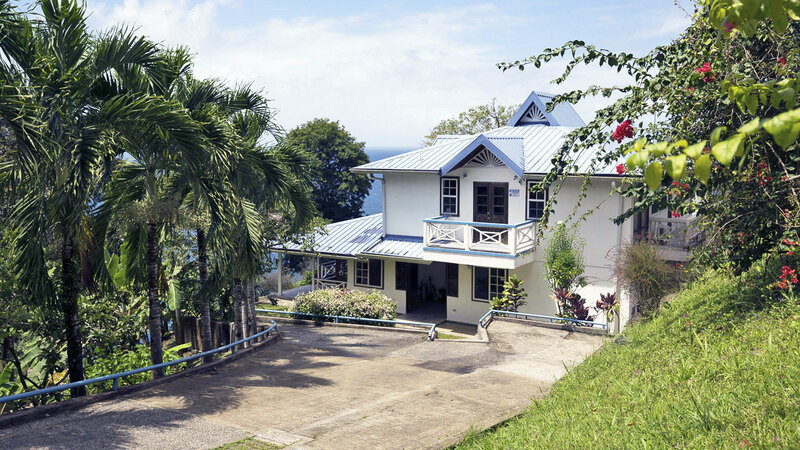 High on a cliff overlooking the sea, Gloucester Place commands one of Tobago's finest views of the Caribbean Sea in one direction and the Rain Forest Reserve in the other. Just a short walk from the picturesque fishing village of Parlatuvier, this area is considered one of the loveliest on the island. From the veranda, guests can enjoy the mesmerizing crashing of waves against the rocks, daily migrations of frigate birds cruising along the coast, humming birds sipping nectar or bananaquits gathering at the feeders. They can listen to the early morning cries of the cococricos followed by the chatter of the parrots, and songs of other island birds. Book Now Tell Me More! The property consists of the guesthouse, a cottage, and a swimming pool, bounded by a river on one side and the sea on another. 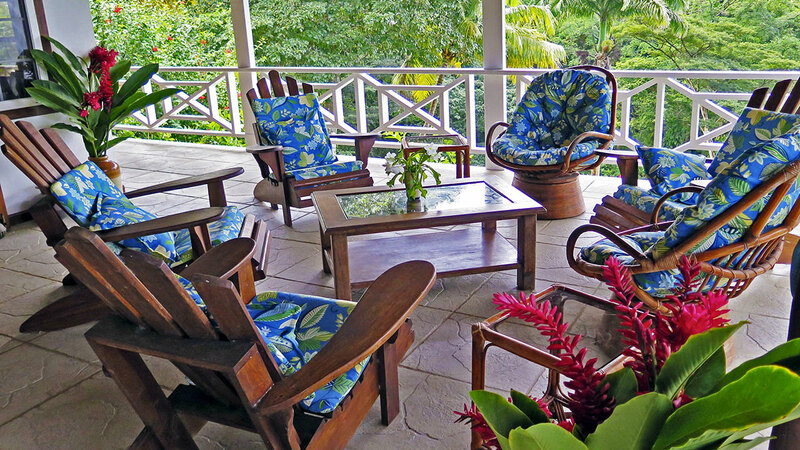 Surrounding the houses are mature gardens, coconut palms, mango and other fruit trees, and lots of banana plants. A path leads along the hillside past the fruit trees, down to Creighton River and our own waterfall and swimming hole. Always in the shade, this is a favorite spot for children and adults to play and explore. 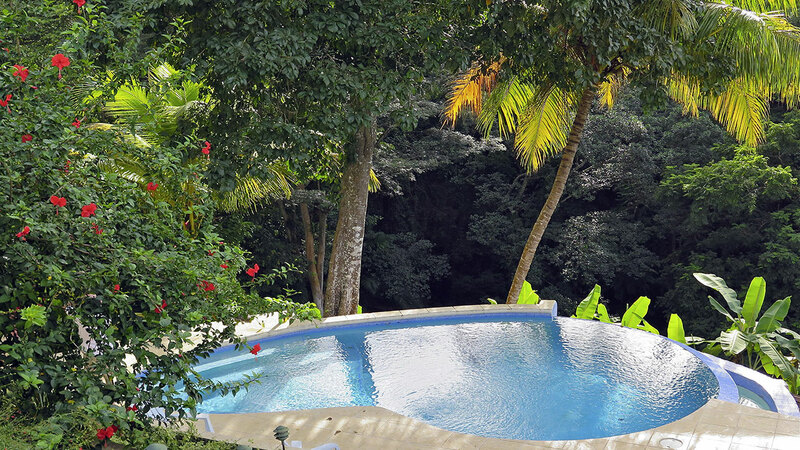 The infinity pool is a centerpiece of the property. Guests can relax in the water while gazing across the horizon ready to spot passing sail boats and fishing pirogues as they head out to sea. It has special steps that create a shallow area for children as well as seating to enjoy the view. Just below the pool is a platform that can be used for sunbathing, yoga and, on special occasions, for pitching a tent that provides the best accommodation on site according to our grandchildren.